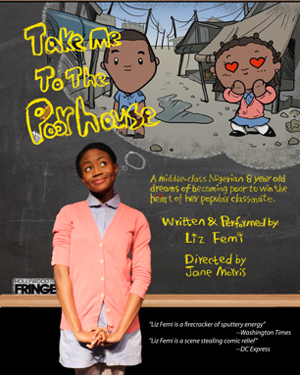 A sparkling new comedy about Lizzie, a middle-class Nigerian third grader who dreams of becoming poor to fit in and win heart of her popular classmate. Inspired by true events, this "upside-down Cinderella story" is a children's story for adults -- witty and wise, hilarious and heartfelt. Audiences are offered a fresh glimpse of African life as they are introduced to a girl eager to reject herself in to order to feel like she belongs. Recipient of the American Repertory Theatre Moscow Art Theatre Institute Alumni Association's Lab Grant, and finalist of NELA Art microgrant. Take Me To The Poorhouse pledges to donate 10% of all ticket proceeds to Mama Hope, a non- profit with a mission to "Stop the Pity and Unlock the Potential" in several African communities. www.mamahope.org.